Civic Center Residents Coalition NYC: A family comes together to help all New Yorkers in the wake of personal tragedy. A family comes together to help all New Yorkers in the wake of personal tragedy. The Civic Center Residents Coalition reported on the passing of Stuart Gruskin in June of 2009. We also reported on the founding of the Gruskin Family Foundation. Sadly cycling blogs and bike lane advocates didn't acknowledge the passing of Mr. Gruskin, that is until his wife Nancy Gruskin turned personal tragedy into her mission - to make sure this kind of thing doesn't happen to more New Yorkers. Stuart Gruskin was struck by a cyclist going the wrong way, with no bell, no brakes, and no helmut. The cyclist worked for a catering company who, after the accident, settled with the Gruskins out of court. Nancy Gruskin is nearly impossible to ignore these days, she initiated a dialog with Commissioner of Transportation Janette Sadik-Kahn shortly after the cyclist hit and killed her husband in 2009, to start teaching delivery men and women to be more responsible cyclists and to make sure the City was up to enforce the laws regarding safe cycling. Sadik-Kahn, living up to her reputation as a less-than-sensitive bulldozing machine who listens only to those clutching bike helmets when speaking to her, sent a form letter response to Gruskin's request for a meeting addressed to Gruskin's late husband Stuart. The faux pas got some press, and the Commish was forced to make up for it with a meeting, who knows if she would have met with Gruskin had the snafu not occurred? City leaders have commented that they can't even get a phone call returned by Sadik-Kahn, others have been on the receiving end of a shout-fest instead of a conversation. We're sure The Great Kahn was minding her manners when confronted with a real life hero like Nancy Gruskin. 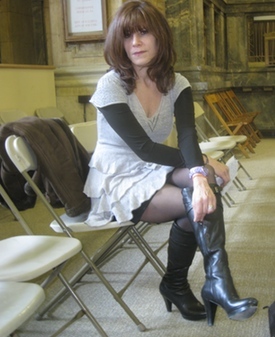 So here's three cheers for Nancy Gruskin - A NY'er of the week on NY1 News. &left;--- click here to see the video of Nancy's interview. Thank you Nancy Gruskin for the courage and determination in turning a personal tragedy into a public crusade that is saving lives every day!